Infographics and visual thinking focused on renewable energy and climate change. About 1.58 million photovoltaic systems with a total capacity of 41 gigawatt [GW] are installed in Germany, ranging from small rooftop systems to large solar parks. In 2016 photovoltaics produced approximately 5.9% of Germany’s net electricity generation. Almost half of the capacity is installed in the southern states Bavaria [11.6 GW] and Baden-Württemberg [5.4 GW] followed by North Rhine-Westphalia [4.5 GW]. In Germany growth of photovoltaics has been an exponential curve between 2004–2012. During the peak years 2010-2012 the capacity grew by over 7,000 megawatts [MW] annually. As a result of politically motivated adjustments to the Renewable Energy Sources Act [EEG], there was a market collapse that resulted in a loss of more than 80% growth. With a new installed capacity of 1,520 MW the result of 2016 did not even meet the growth target set by the government [2,400 to 2,600 megawatts per year]. 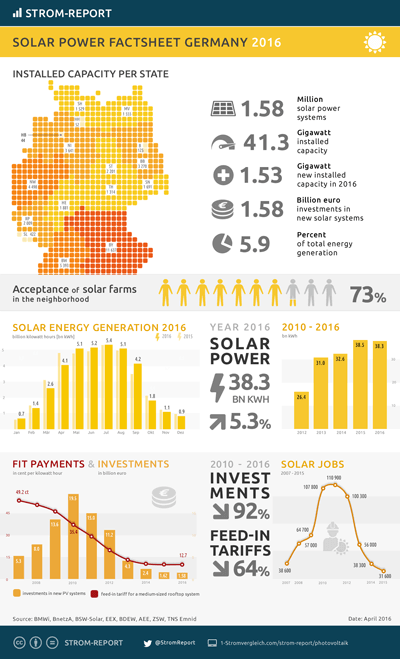 1.58 billion Euro have been invested in new photovoltaic installations in Germany in 2016. This is a decline of almost 400 million compared to 2015 and a drop by 92% since the record year of 2010. As the German Renewable Energy Sources Act [EEG] guaranteed a fixed feed-in payment it provided sustainable planning security for investors in PV systems. The feed-in tariff was set for a 20- year term at regular intervals and is covered through a surcharge on consumer electricity bills. The government has provided – and afterwards cut – the incentives for solar energy systems. The amount of new installations declined significantly due to the restrictive governmental policies. This and the competition with cheaper Chinese products have led to numerous business shutdowns over the past 5 years. By the end of 2015 almost 80000 jobs were lost. What do you think about the solar energy in Germany?